How can tortoises and pinwheels help your students? Charlie Roden shares two examples of creative interventions to enhance your students' wellbeing. Having worked as a TA in a secondary school, one of my main responsibilities was to lead and support student interventions. These included reading, maths, lego therapy and speech and language therapy ­– interventions that many other schools may also offer. However, we also had other creative and unique interventions to help students improve their communication skills, build relationships with others and, perhaps most importantly, enhance their wellbeing. The intervention I spent most of my time involved in was ‘tortoise time’, whereby individual or groups of students (known as ‘tortoise monitors’) come out of their normal timetabled lessons to spend some time with the residential tortoises, Jake and Doodles. Although this may seem like just a bit of fun (which it is! 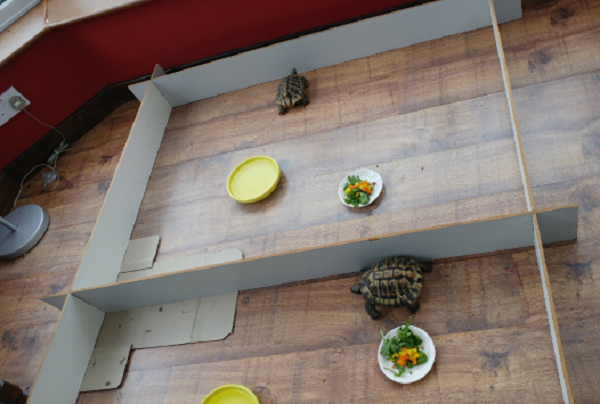 ), looking after the school tortoises actually has a vast range of benefits for the students. As many of the students involved in tortoise time have additional needs, this intervention gives them the perfect opportunity to build on their soft skills including teamwork, social interaction and motor skills. Students work together with those from other classes and even other year groups, giving them opportunities to speak to people they wouldn’t normally have the chance to, increasing their confidence and enhancing their ability to build relationships with their peers. Each student is assigned a task. Sometimes I would do this, but often other, more confident students would assign the roles themselves. bathe the tortoises – measuring out the right amount and temperature of water, wiping the tortoises’ shells and feet and leaving them to bathe for a while to rehydrate. Once the students have done this a couple of times, they do not need any prompting or reminding what to do in their role. Working with the tortoises enhances their abilities to follow instructions and retain information. Although there is always a member of staff overseeing the students, it is ultimately their responsibility to ensure the tortoises are clean, safe and happy. Even though Jake and Doodles are brothers, they can sometimes fight, so it is up to the students to prevent this from happening. Many students would not be given this sort of responsibility at home, giving them a sense of importance and building up their self-esteem. There has been much research over the past few years on the positive effects that animals have on our wellbeing, particularly with people who suffer from anxiety and children with autism. I was lucky enough to witness this in a school setting; if a student refused to set foot into school when they arrived, or couldn’t leave their house in the morning, the use of tortoise time as a positive emotional regulation intervention would often encourage them to come in. Some of these students would be quite stressed when they came into school, and having some quiet time holding the tortoises would calm them down and prepare them for the rest of the school day. I also witnessed the calming effect of the tortoises during a curriculum support transition morning. Many of the students who came to this event had some form of additional need and were quite reluctant to mingle with others. Some of the students who were there that day have now become tortoise monitors themselves! Any school animal can be used to reduce student anxiety, but if you don’t have animals in your school, below is another example of an intervention that can enhance your students’ wellbeing. Our Supporting Student Wellbeing in Independent Schools Conference takes place on Tuesday 30 April 2019. By attending this conference you will be given the chance to help your students thrive with outside-the-box solutions to imrpove your students' wellbeing. Last summer, we ran an intervention where students could make their own pinwheels, teaching them mindful breathing techniques. There are many reasons why mindful breathing is important for students. It decreases your stress levels. It gives you more control of your emotions. It oxygenates your body, making you feel more energised. It enables you to stay calm and reduces anxiety. According to a survey by Barnado’s, nearly half of children aged 12 to 16 in England ‘feel sad or anxious at least once a week’, with 65% of students claiming the main cause of their stress ‘as being school.’ Therefore, it makes perfect sense for interventions involving breathing techniques to be provided for all students, not just those known to us with anxiety disorders or additional needs. Breathing with a pinwheel requires you to purse your lips. Known as ‘pursed lip’ breathing, this is used to help people with COPD who suffer from shortness of breath, controlling their breathing rate and allowing more oxygen to flow into the body. Cut along outline of both templates. Apply glue over the whole of the back of one template, sticking it to the front of the other template. Cut along the diagonal lines towards the centre. Gather the four corners towards the centre and hold them in place. With the paper fastener, punch a hole in the centre. Place the straw behind the pinwheel, punching a hole in it, and fasten. 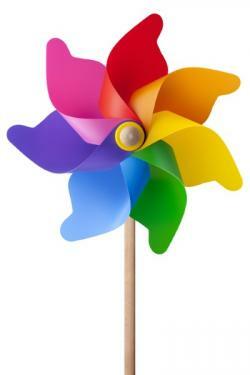 Blow on the pinwheel to make it spin! Before you begin the activity, ask students if they can tell the difference between their breathing when they are calm and when they are anxious or stressed. Being anxious speeds up our breathing as the muscles that allow us to breathe become tighter, giving us shortness of breath. Inhale slowly through your nose for around three seconds. Hold your breath for two or three seconds. Blow out for about five seconds, or however long is comfortable. Try to breathe out for longer than you breathe in, but don’t try to force your breath out. Ask students how they feel, comparing it to their breathing before. Do they feel more relaxed? We all know that school can be a stressful environment not only for students, but teachers too. Next time you feel your stress levels rising, stop what you’re doing and try the pinwheel breathing technique, or one of the many other mindful breathing strategies. Not only will this make you feel calmer, but it will also stop you projecting your own stress onto your students.